Best wishes to all for a safe and happy New Year’s Eve. It’s never too soon to plan for Tomorrow. 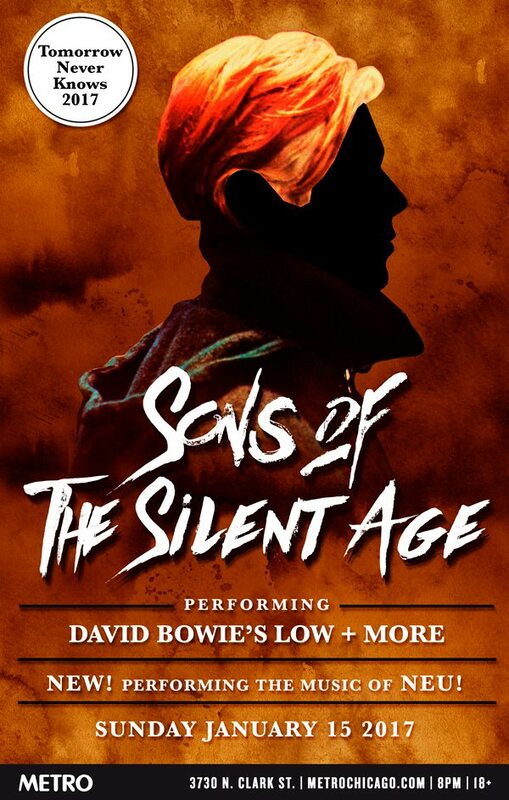 Sons Of The Silent Age, the Chicago-based David Bowie tribute band, will be performing Bowie’s Low album and other songs on January 15 at Metro. The event is part of the 2017 Tomorrow Never Knows festival. 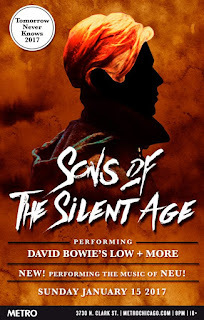 I’ve seen Sons Of The Silent Age at Taste Of Chicago and on a few other occasions, and they do an astounding job of covering The Thin White Duke. Happy Birthday to Patti Smith. After celebrating that milestone tonight, she’ll be at at Park West tomorrow with her band to bring in the New Year. Other contenders for the countdown include the critically acclaimed, Ohio-based alt rock/roots rock band Over The Rhine at The Old Town School Of Folk Music; the eclectic and eternally unpredictable EXPO ’76 and guest vocalist Kelly Hogan from The Flat Five at FitzGerald’s; and Nice Motor, Lucky Boys Confusion, and Mark Rose from Spitalfield at the Double Door. That’s what post-Christmas entertainment is all about, Charlie Brown. Emerald City Theatre is presenting A Charlie Brown Christmas through January 8 at the Broadway Playhouse at Water Tower Place. In a little over two weeks, the Peter Asher: A Musical Memoir Of ‘60s and Beyond will take place at The Old Town School Of Folk Music on Chicago’s north side. I’ve seen Asher do this type of show at Old Town School Of Folk Music before, as well as at Fest For Beatles Fans - Chicago; He and his backup band are entertaining and informative. In addition to being half of Peter and Gordon, Asher has had a successful career as a producer for James Taylor, Linda Ronstadt, and other well-known artists. It’s not about Bikini Kill, L7, Babes In Toyland, or Sleater-Kinney, but the new Riot Grrrls exhibition at Chicago’s Museum Of Contemporary Art does celebrate the work female painters like Joyce Pensato, Ellen Berkenblit, and Jackie Saccoccio. 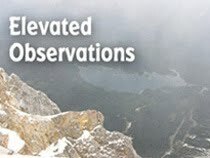 It runs through June 4, 2017; suggested admission is $12. When the Milwaukee-based band Trolley released its masterful Caught In The Darkness earlier this year, I praised songs like “Thursday Girl,” “We All Fall Down,” and “The Kids All Sing” as straight up power pop gems in my February 1 review. The album is now available on vinyl on the Sugarbush Records label. Tickets went on sale today for The Bodeans’ show at The Arcada Theatre on March 11. Other shows coming up at The Arcada include Micky Dolenz on February 11; The Buckinghams, The Ides Of March, The New Colony Six, The Cryan Shames, and The Shadows of Knight on February 14; Greg Kihn on March 10; George Thorogood And The Destroyers on March 22; and Dave Davies from The Kinks on April 8.